Outbound from Clydebank for Eastham on the Mersey, the Marshall Islands-flagged tanker MARIDA MAPLE was seen passing the Cowal Buoy on Thursday afternoon. She was built in Korea in 2008, being delivered on 6 November. 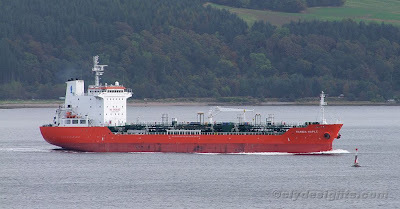 Owned by Marida Tankers and operated as a member of WOMAR Tankers, MARIDA MAPLE is 127.9 metres in length and has a deadweight of 13,132 tonnes. She had been delivering a cargo of fuel from Rotterdam to Rothesay Dock.